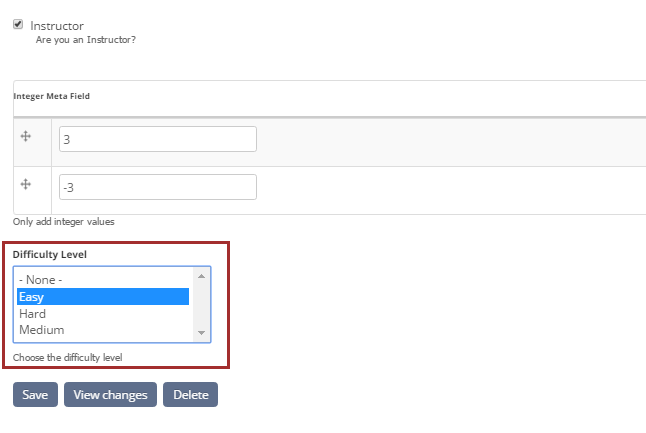 Teamie allow administrator to add custom Meta fields to a classroom via administrator interface, apart from the default set of Meta fields which a user normally see while setting up new classrooms. Being the latest addition to our product, our clients can use this feature to define new Meta fields for their classrooms and track additional information in them, which was not possible earlier with default set of Meta fields. What is a classroom Meta field? Classroom Meta fields are the basic fields that are required to be in our Teamie database to identify classrooms. It can be a mandatory field such as Title of the classroom, or it can be an optional field such as description of a classroom. Each client wants different fields based on their requirements which Teamie used to create for them. Now you can create the classroom dynamic Meta fields by yourself. As an administrator, you can now add any Meta fields and it will automatically show up as a filter on the Manage Classrooms page. For example, your classroom might have a “Grade” or a “Level” or a “Department” field which you’d want to capture on Teamie. 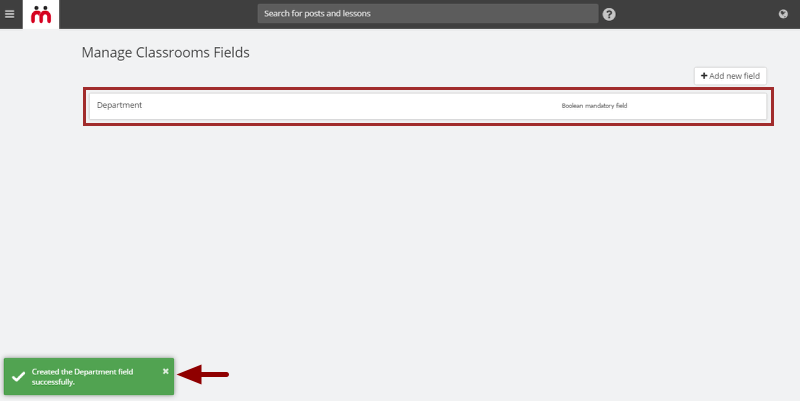 And you’d want these fields to automatically appear as filters in the Manage Classrooms page, so that you can use them to quickly filter and view a subset of classrooms on your site. You can do this easily by creating a new Meta field. Let's see how it's done. 1. These type of Meta fields are used where a two-state criteria logic is used to filter out the information. The two states being 'Yes' and 'No'. For example, you can filter out the instructors and learners in a classroom with this Meta field. 3. On the Manage Classrooms page, if selected it will appear as a filter with 'Yes' or 'No' options to filter a classroom. Also, if selected, the Meta field will appear in the field listing. 4. This type of Meta field is used in case you need to enter only an integer as a value in the Meta field. This type of Meta field cannot appear in the manage classroom filter. 5. You can set the number of values for this Meta field. For example, if you selected '2' number of values, then you will get two boxes on the classrooms creation page page to enter the integer values. 1. This type of Meta field can be used in case you want to filter some pre-populated values. For example, you can pre-populate subjects or grades of a classroom and then later filter them according to the list Meta field. This Meta field is used for fixed set of data, that is, you pick one value and assign it to the classroom. 3. On the Manage Classrooms page, if selected it will appear as a filter with the pre-populated values. Also, if selected, the Meta field will appear in the field listing. 1. To pre-populate values, click Manage List Values after you have added the List(text) Meta field. 2. Then, click Add term to add the data values. 3. Type the Value name and click Save. 4. Similarly you can add more values. After you have added the required number of values, click Cancel, Back to list of values. 5. 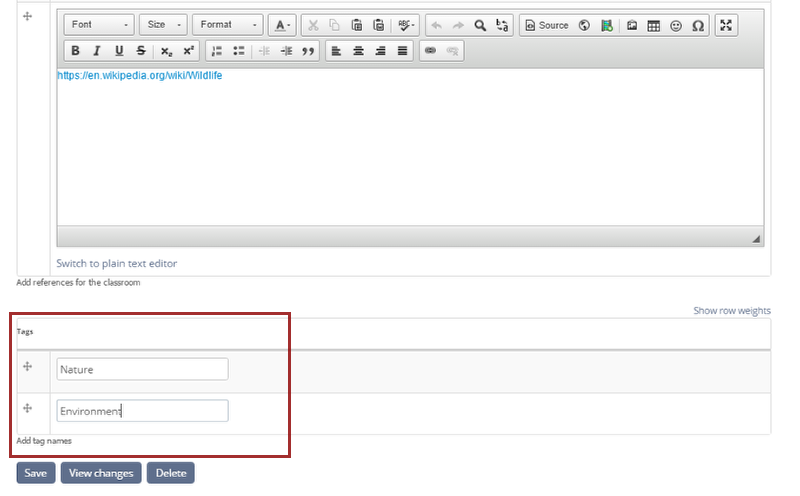 You will be able to view the list of values that you have added for the List (type) Meta field. 1. This type of Meta field allows you to add data with a wide degree of freedom. You can add rich text or even add links to this field to link other sites to the classroom. One thing to note about this Meta field is that you cannot make this field appear in the Manage Classroom filter or in the classroom field listing column. Also, you can create more than one value of the Meta field and that number of fields will show up on the create classroom page. 3. 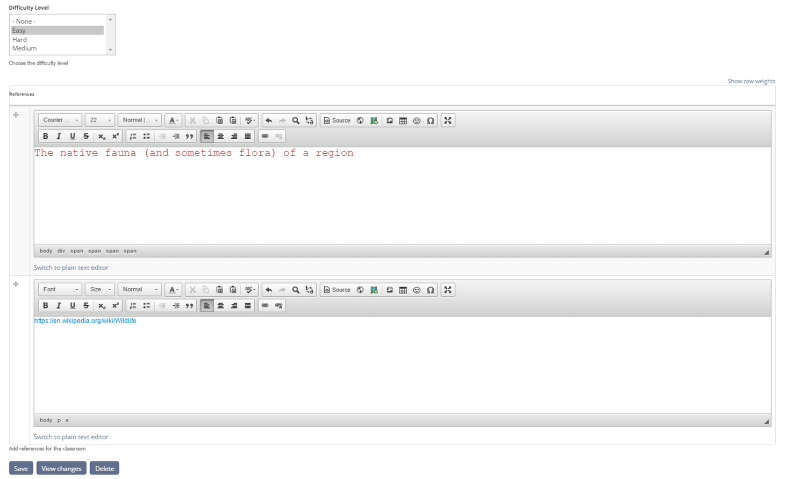 You can use the rich text editor to enhance the text or even add links to your text. 1. This type of Meta field can be used for small descriptions. The difference between this field and 'Long text and summary' is that this field doesn't support rich text and neither you can add links. But you can make this field appear both in the Manage Classroom filter and in the classroom field listing column. 3. On the Manage Classrooms page, if selected it will appear as a filter. Also, if selected, the Meta field will appear in the field listing. 1. From the Manage Teamie block, click Manage Classroom Meta Field List. 2. Click +Add new field. 3. Type in the field name that will serve as the title of the Meta field. By default the name of the Meta field is set as 'Sample Dynamic Field'. Tip: Click X to remove the whole field label at once and type in a new label. 4. Select a Field Type from the drop-down menu. 5. Type a description for the Meta field. This help users get a better idea about the Meta field. 6. Set the number of values that you want for your Meta field. 7. To make the Meta field mandatory, tick Make field mandatory checkbox, else leave it unchecked and the newly added Meta field will remain optional. 8. 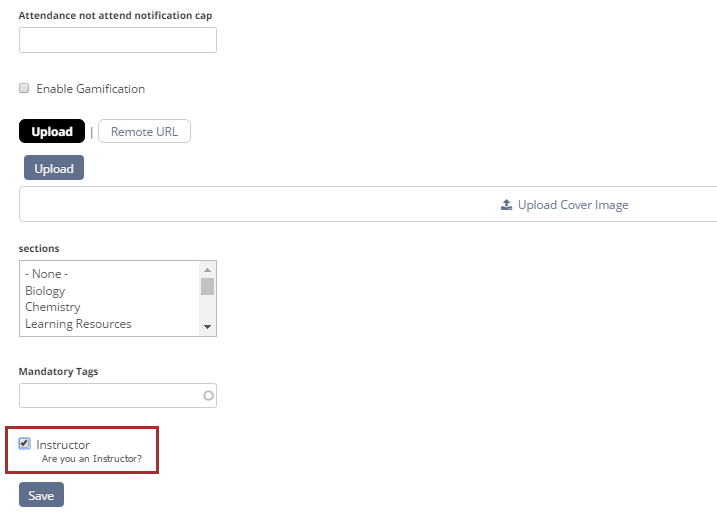 In case you wish to use newly created Meta field as filter on the manage classrooms page, then tick Appear in the manage classroom filter checkbox. 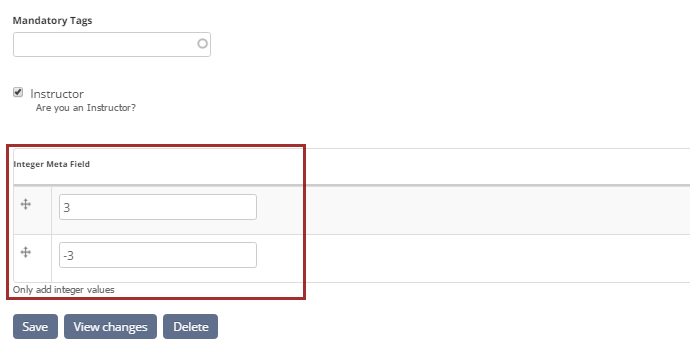 Ticking this checkbox will make the Meta field appear as a filter on the Manage Classroom page. This can prove very useful in case you wish to filter the classroom data based on this Meta field. 9. Tick Appear in the manage classroom field listing checkbox. Ticking this checkbox will make the Meta field appear as a column in the Manage Classroom page field listing. 10. Click Create to add the new classroom Meta field. 11. A success message appears showing that classroom Meta field has been created successfully. Being an administrator, you may add new Meta fields for classrooms in Teamie as per your requirement to track additional information about classrooms which cannot be tracked with the standard classroom’s Meta fields provided by Teamie while setting up a new classroom. Assume that you’re done with adding such Meta field’s for classrooms and now wanted to update the value of newly created Meta fields for all existing classrooms. You can do it by exporting the required Meta field along with all classrooms in an excel template, entering the Meta field value for each classroom and then uploading the template again. After the import process is completed, all existing classrooms would be assigned the Meta field value as defined / mapped in the template and you can start tracking data based on the newly defined Meta fields from the Manage Classrooms page. Let’s see the step by step procedure. 1. On the Manage Classrooms Fields page, hover over a Meta field to see the export/ download template icons. 2. Click Download Template to download the template. 3. Open the downloaded template. 4. You'll notice that for few classrooms which have been created after creating the new Meta field for classrooms, those classrooms have been assigned or mapped a value as Yes by default (Yes is coming by default because field type for this Meta field is selected as Boolean and this field is marked as mandatory for new classroom creation), whereas there is no value assigned or mapped for all other existing classrooms. So, to update the Meta field value for all existing classrooms, you may assign or map a value for each classroom and upload the template again in Teamie. 5. 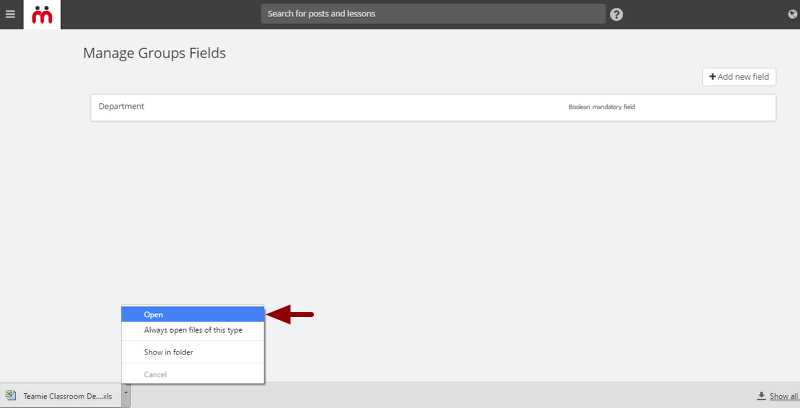 On the Manage Classrooms Fields page, hover over a Meta field and click Import Field Values. 6. Click Choose File, select the template and click Open. 7. 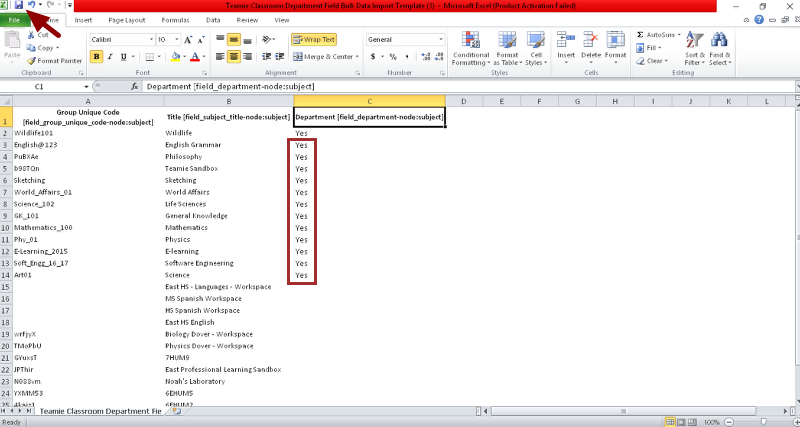 After the excel file is uploaded, click Import The Data Set. 8. Once the import process is successfully completed, you will be redirected back to the Manage Classrooms page where you will see that the Meta field values have been updated for all existing classrooms. Tip: You can filter data according to the new Meta field that you have created. You can edit/ update custom Meta fields anytime and the effect will take place immediately. Note: You can not change the Field Type of any Meta field once it i created, and it would remain unchanged during editing process. 1. 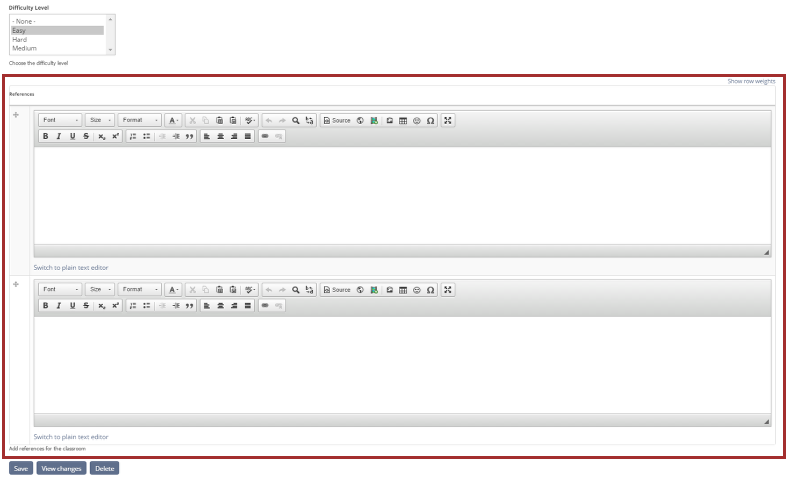 On the Manage Classrooms Fields page, click the Meta field to view the options available for editing a Meta field. 2. Update the Meta field information as per your requirement. 3. After you are done making the changes, click Save. 4. After the Meta field is updated, a success message appears showing that you have updated the Meta field successfully. Being an administrator, you can remove custom Meta fields anytime. The deleted Meta field will be removed from all classrooms. Note: The deletion is permanent. Once deleted the Meta field cannot be recovered. 2. 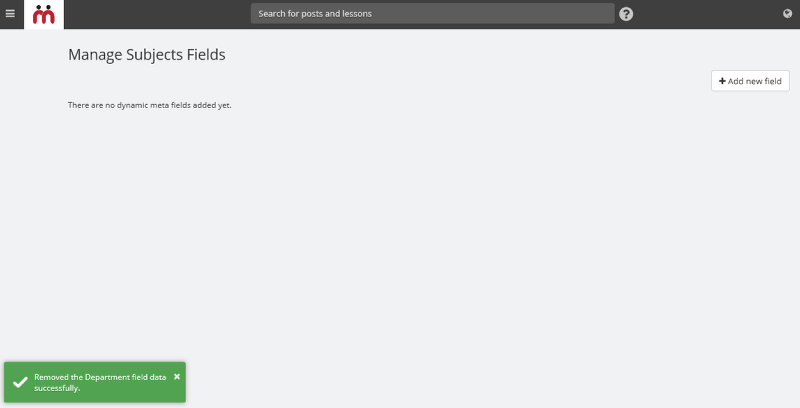 On the Manage Classrooms Fields page, hover over the required Meta field. Icons will appear as soon as you hover over the Meta field. 4. Click Yes, delete! if you are sure about deleting the field department. Click Cancel in case you have changed your mind. 5. A success message appears showing that the Meta field data has been successfully deleted.